CDKL5. The next gene in our weekly review of known epilepsy genes is CDKL5. Even though CDKL5 is one of the most common genes for epileptic encephalopathies, we have never really featured this gene on our blog. Let’s catch up with a brief post on what you need to know about CDKL5 in 2015. Phenotype – Epilepsy. CDKL5 encephalopathy is an early onset epileptic encephalopathy where seizures usually manifest before the 3 months of age. CDKL5 is located on the X chromosome and the vast majority of patients are girls. Affected boys often have a more severe phenotype. Prior to the onset of seizures, patients typically present with muscular hypotonia and delayed gross motor development. There is some suggestion that patients with CDKL5 have some subtle but shared dysmorphic features including a broad forehead, deep-set eyes, full lips and tapered fingers. The epilepsy in patients with CDKL5 encephalopathy has been suggested to occur in three typical stages including early epilepsy with focal seizures in the first stage at the age of 4 weeks to 6 months, followed by epileptic encephalopathy with Infantile Spasms in infancy and early childhood as the second stage and tonic seizures and late myoclonic epilepsy in childhood as the third stage. Seizures are usually refractory to antiepileptic medication and there is currently no clear consensus regarding the best treatment regimen. Phenotype – Development. The development of patients with CDKL5 encephalopathy has been investigated in smaller case series and some larger studies. More than 90% of patients with CDKL5 encephalopathy have profound developmental delay. Approximately one fourth of patients with CDKL5 encephalopathy gain the ability to walk independently by the age of 5 years or use single words. However, most patients with CDKL5 encephalopathy do not attain these skills. Historically, our concept of CDKL5 encephalopathy is derived from clinical criteria that were used for Rett Syndrome, as patients with CDKL5 encephalopathy may developed stereotypic hand movements that are seen in Rett Syndrome. However, CDKL5 encephalopathy is currently recognized as a separate clinical entity. Importantly, the regression seen in Rett Syndrome is typically not seen in patients with CDKL5 encephalopathy who have delayed development from birth. Genetics. 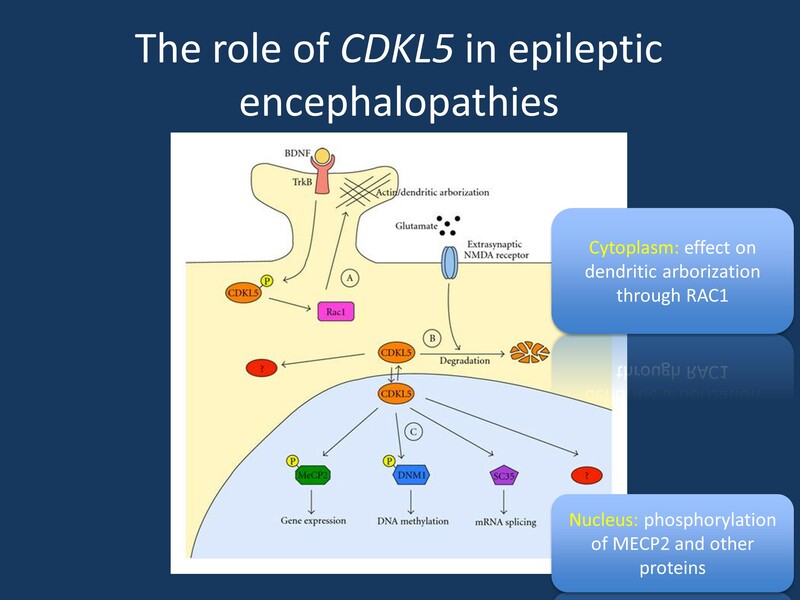 CDKL5 encephalopathy is due to haploinsufficiency of the CDKL5 gene coding for cyclin-dependent kinase-like 5. In earlier publications, this protein was also called serine/threonine protein kinase 9 (STK9). The gene is located on Xp22.13. Various genetic alterations including deletions, truncating mutations, and missense mutations have been described in patients with CDKL5 encephalopathy and these changes typically arise de novo. Initially, the gene was identified through translocations in two girls with a phenotype that was referred to as X-linked Infantile Spasms. As of 2015, more than thousand patients with CDKL5 encephalopathy have been reported and more than 200 pathogenic mutations are found in ClinVar. It was initially thought that a CDKL5 encephalopathy is extremely rare and severe in males given the X-chromosomal inheritance, but there are increasing reports of de novo CDKL5 mutations in boys with epileptic encephalopathies. The phenotype in boys is considered more severe. Mechanism. The mechanism how mutations in CDKL5 lead to an epileptic encephalopathy remains poorly understood. The CDKL5 protein works as a kinase and phosphorylated proteins both in the cytoplasm and in the nucleus and many of the targets and downstream effects are not known yet. It is thought that absence of one functional copy of CDKL5 may lead to a domino effect on the downstream targets, resulting in a broad range of transcriptional abnormalities. Here is what you need to know about CDKL5 in 2015. Databases. In contrast to many other rare epileptic encephalopathies, there is much data out there on CDKL5 encephalopathy. For example, the CDKL5 community provides the CDKL5 Disorder International Registry Database that currently has more than one hundred patients included. There is also an epilepsy specific PCORI database with the Rare Epilepsy Network (REN). Phenotypes – seizure. In a publication in Neurology in 2011, Klein and collaborators suggested that there may be a distinct seizure type that can be observed in patients in CDKL5 encephalopathy. The authors referred to this seizure type as a hypermotor-tonic-spasms sequence and the freely available online Supplemental Material provides some examples of these seizures types. Phenotypes – EEG. A few years ago, we were baffled by the fact that some patients with CDKL5 encephalopathy who we cared for had the EEG feature of hypsarrhythmia until late into the course of their disease. This phenomenon is somewhat atypical for patients with hypsarrhythmia and we were wondering whether “late hypsarrhythmia” may be collated with a more severe neurocognitive outcome. Mechanism – GSK3. In a recent study in Neurobiology of Disease, Fuchs and collaborators examine one of the downstream targets of CDKL5, the glycogen synthase kinase 3 beta (GSK3B) and we referred to this publication in one of our publications of the week issue. It had been shown previously that GSK3 beta is upregulated in a mouse model of CDKL5 encephalopathy. This upregulation was paralleled by a reduction of neuronal precursor survival and maturation. By inhibiting GSK3 beta, Fuchs and collaborators demonstrate that blocking GSK3 beta actually reverses some of the hippocampal development defects seen in the CDKL5 model. This concept is quite interesting as it may present a novel therapeutic avenue as inhibition of protein or gene function is easier to achieve than restoring gene function. This entry was posted in CDKL5 and tagged CDKL5, meCP2, STK9. Bookmark the permalink. We also have an epilepsy specific PCORI database, with the Rare Epilepsy Network (REN). Center’s of Excellence in Denver, Boston, and Cleveland trying to bring the clinical pieces together as well. Thank you! I’ll add this to the blog post. Excellent review. Enjoyed reading it as a parent and also as a trustee of a CDKL5 charity. It should however be noted that there are well over 1000 now diagnosed worldwide and likely to be many more that don’t access social media. thank you for your comment. I’ll correct the numbers in the blog post. I just didn’t have a good reference for the total number of patients diagnosed so far, but I agree that this is probably much more than what we know. So timely. Keep up the great work!